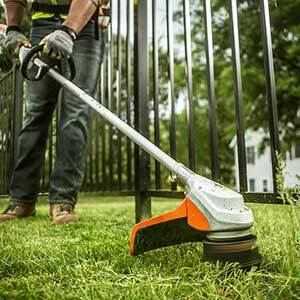 Stihl expanded its Battery KombiSystem lineup with the addition of the FSA 90 R trimmer. The cordless trimmer is quiet but powerful, Stihl said, and designed for professionals working in noise-sensitive or emission-sensitive areas like school grounds, business districts or hospitals. The battery-powered system also eliminates the need for gasoline and two-cycle oil. The machine features a 15-inch cutting width and the AutoCut 25-2 mowing head loaded with .095-inch Quiet Line. The FSA 90 R starts instantly with the squeeze of a trigger. Its innovative control handle features an EcoSpeed throttle set wheel, allowing users to set the most effective throttle speed for a specific application. For example, low throttle might be used around delicate plants or to extend the amount of work done on a single charge, Stihl said. The FSA 90 R is one of 14 tools in the Stihl Battery KombiSystem line. This system is designed so that a single Stihl lithium-ion battery can power multiple tools and tackle a wide range of outdoor projects.